- The shares are recovered slightly, but year to year loss is $12K (difference)+$48K (invested amount) +$6 (reinvested dividends) = $ 66K USD. 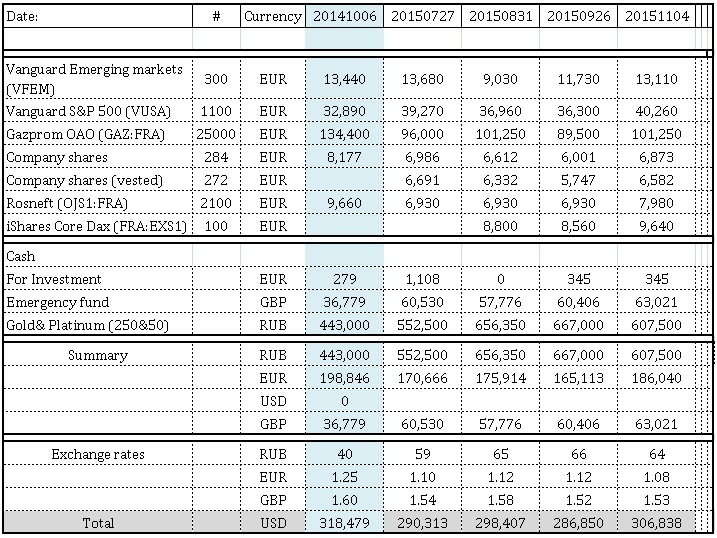 Main contributors are Gazprom shares $31 K USD and EUR to USD exchange – 30 K USD. EUR lost 14% over last 12 months. GBP lost 4%. Last month BP was told by US Attorney- General Loretta Lynch that by paying $20.8bn to settle charges over the Deepwater Horizon oil disaster, it was “receiving the punishment it deserves”. Ms Lynch was less vocal on whether BP deserved to have only $5.5bn designated as a non-tax-deductible penalty under the Clean Water Act. As was BP’s finance director on the $15.3bn of tax relief it has, in effect, been granted. These are not small technical tax loopholes, either. It may not surprise readers to learn that banks have been using the US tax code to cut the cost of regulatory settlements for years. In 2014, Bank of America’s $17bn mortgage settlement contained $5bn of non-tax-deductible fines, but the other $12bn for costs and compensation was deductible as an ordinary business expense — saving around $4bn in tax. A year earlier, JPMorgan’s chief financial officer admitted that $7bn of compensation within its $13bn mortgage settlement was “deductible for tax purposes”. In 2012, UBS agreed to a $1.5bn settlement of interest-rate rigging claims — much of which was tax deductible under US tax rules, but not the Swiss law that applied in this case. Even the UK’s Lloyds Banking Group added £1.4bn to its provision for insurance mis-selling in the last quarter — its last chance to claim a tax deduction on these costs before a change in the law. Imagine if this principle applied to individuals. It would be possible for marginal rate taxpayers to deliberately incur a fine on underpaid tax, use the fine to reduce their taxable income to a lower or zero-rate band, and then successfully appeal the original fine. Try suggesting that to the IRS or HM Revenue & Customs. Allowing companies this tax dodge, however, costs individuals. As the US Public Interest Research Groups federation points out, every tax saving that companies make in this way is subsidised by individuals — through higher personal tax, spending cuts or increased government debt.